River Rock Panels There are 3 products. River Rock Panels - Interlocking Rocks. Imagine how long it would take anyone to gather the needed amount of river rocks, with the correct dimensions for the corners and install them on a fireplace, a cabin or any wall. It is definitely not the easiest way to create a rock wall. 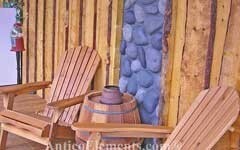 With these panels and accessories you are now able to create a faux rock wall in a matter of hours. It is also not necessary to find a specialized installer or mason because these rock panels are designed with the average homeowner in mind.